Do you find yourself denying your right to new opportunities due to a lack of self-assurance in your abilities? Do you sometimes find yourself questioning what others might be thinking when it comes to your credibility? If you answered yes, maybe, or possibly in your head to any of these questions, you just may suffer from Imposter Syndrome—and it’s killing your confidence levels! Here are a few tips on how you can combat it. Confidence, a.k.a self-assurance, can take a lifetime to not only build, but sustain. There are many things that we come across in life that may take a hit at our confidence in ourselves and in what we are capable of. One of those mischief-makers is known as Imposter Syndrome. Imposter Syndrome is a fraudulent feeling found in many high-achievers. It’s a collection of lurking thoughts that include ideas about not being qualified enough, inadequate, and even incompetent— although there is an overwhelming amount of evidence that you are capable and equipped. These feelings can not only be huge crosses to carry, but can also create major barriers to entry for many new opportunities that involve elevating your stature, career progression, etc. 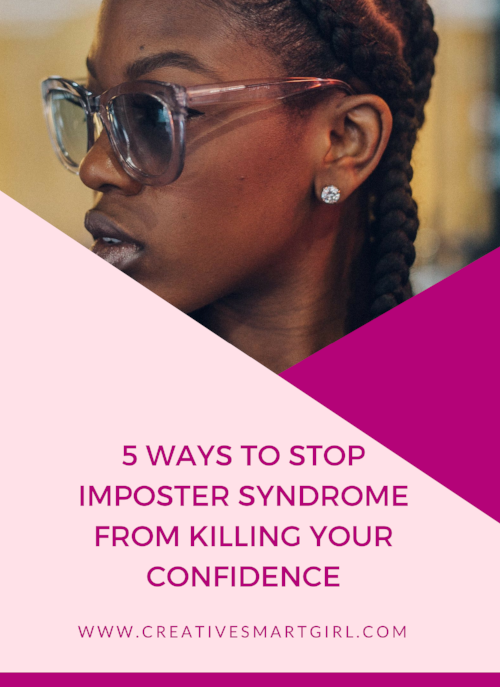 The number one way to fight Imposter Syndrome is to rebuild your confidence in your own abilities and qualities. Identify Your Narrative [and change it]. Take a minute to reflect on your current self-talk. Identify the adjectives you currently use to describe yourself in particular situations. Are you finding that you are using words or phrases like lucky, fake, fraud, not good enough, or imperfect? Take a deeper look into the circumstance where those descriptors are being used. Identify which aspect of the circumstance yields that type of self-talk. There is most likely some unknown factor in the circumstance that is creating some sort of self-doubt. Find it and pull a scenario from your life, where you already combatted that fear. Leverage it as evidence that you can handle this new situation. Own & Celebrate Your Achievements. This may seem simple; It is. K.I.S.S (Keep It Simple Stupid) advice is my favorite type of advice. Owning and then celebrating your achievements is the most concrete way to acknowledge that those achievements were made by none other than you. Acknowledgement yields truth & confirmation, which thus yields confidence (defined as the state of feeling certain about the truth of something). Make sure that you take the time—once a week or twice a month—to reflect on your accomplishments and progress. Grab a friend and celebrate with a movie, Happy Hour, potluck, or a coffee–your call! Take Your Mistakes in Stride. When you start to view your mistakes as part of the process, they sting a lil’ less. It is through your mistakes, mishaps, and failures that you learn the best method, choice, or path. You can only learn and improve by doing. Mistakes are a natural, potential result to DOING. The only bad thing that can come from a mistake is not learning from it. Keep this in mind when you come across times when you “dropped the ball” on a particular task, project, or ask. Take Constructive Criticism Seriously, not Personally. The purpose of constructive criticism is to promote further development and advancement. The key word in that definition is “further” (defined as an addition to what already exists or has already taken place, been done, or been accounted for). Constructive criticism promotes growth, not a destructive way of thinking. Remind yourself of this when being given constructive feedback by not only a superior, but a direct report on a recent project. View Yourself as a Work in Progress. Stop putting so much pressure on yourself. We are all constantly growing, learning, and progressing. We all also have our own unique timelines. You are never done acquiring knowledge in this life—it is an ongoing university. Remembering that you and everyone else around you are all a “work in progress” will help combat those thoughts of perfectionism or worthiness. Realize that there is no shame in asking for help for when you need it. There is also no shame in sharing and demonstrating your knowledge. Taking on a junior colleague may help relieve some of these unsatisfactory thoughts, as you’ll be able to see someone grow and excel using your learned methods. Additionally, remember that the people who have mentored you along the way and who have afforded you the opportunities that have been given to you are extremely competent themselves. They knew what they were doing when they chose you—give them that credit. Joanne Augustin is a Copywriter between the hours of 9am to 5pm and a Writer/Content Strategist every other hour in between. She is the founder of the blog Career.Ambition.Growth, a resource for those who are trying to strive towards those three areas. The blog provides practical insights made to be easily implemented and turned into a goal to work towards. Joanne and her writing tone is the equivalent of black coffee with no sugar added — she is bold and without fear when it comes to providing guidance and giving an unexaggerated, realistic perspective on whatever topic she is presenting.